Heat oven to 425°F. In ungreased 15x10x1-inch pan, mix all ingredients; spread evenly in pan. Roast uncovered 25 to 35 minutes, stirring occasionally, until potatoes are tender and browned. 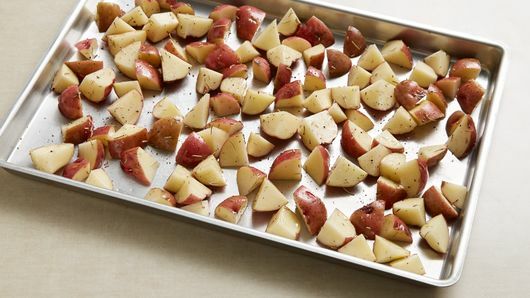 Be sure to cut the potatoes into pieces that are about the same size so they roast evenly. Or look for bite-size potatoes that can be roasted whole. 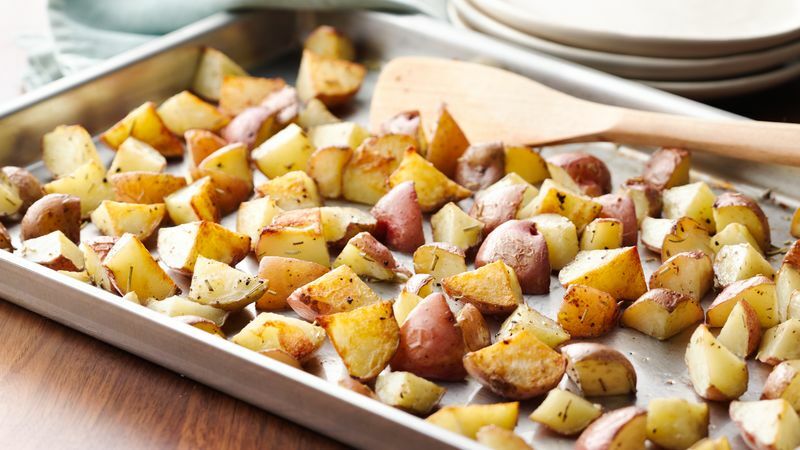 Line the pan with baking parchment, which helps crisp up the potatoes. Mix up the seasoning on the potatoes. Try a Cajun blend, lemon or garlic pepper, or a garam masala or curry powder. Split the baking pan (or arrange on a second pan) with an equal amount of coarsely chopped vegetables, like cauliflower, halved Brussels sprouts, quartered small bell peppers, or halved plum tomatoes that are tossed with olive oil and coarse salt and a grind of pepper. Bake them until they’re browned and tender. We’re equal-opportunity potato lovers at Pillsbury, but if we had to choose just one potato recipe to eat for life, it would be this one. You can’t go wrong with seasoned, oven-roasted potatoes. The red potatoes hold their shape well, making them perfect for roasting. This recipe uses ingredients you probably already have on hand, and you can up the seasoning level (or add your own favorites) to your liking. Plus, potatoes go with everything! Roasted chicken, pot roast, pork chops —the sky’s the limit! Bonus: these versatile tubers make great leftovers, too! If you made too much (is that even possible? ), simply store them in the refrigerator in an airtight container for up to a week. If you’re not sure when you’ll want to eat them again, you can freeze cooked potatoes for up to one year—but with this foolproof recipe, we have a feeling that won’t be the case.